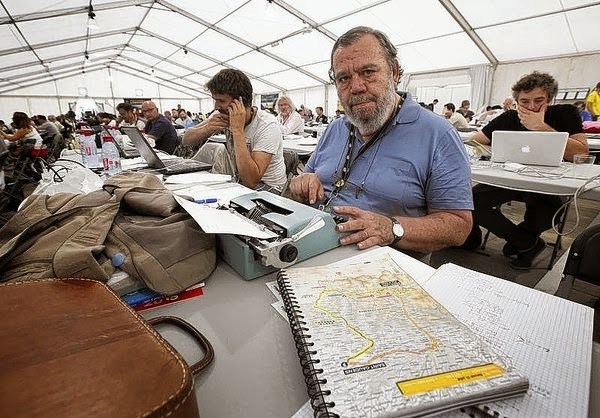 A Reuters story by Julien Pretot on 68-year-old Italian writer Gianni Mura using a 1976 Olivetti Lettera 32 portable typewriter while covering the just-completed Tour de France cycle race was run far and wide last week, including in the sports pages of the Chicago Tribune. 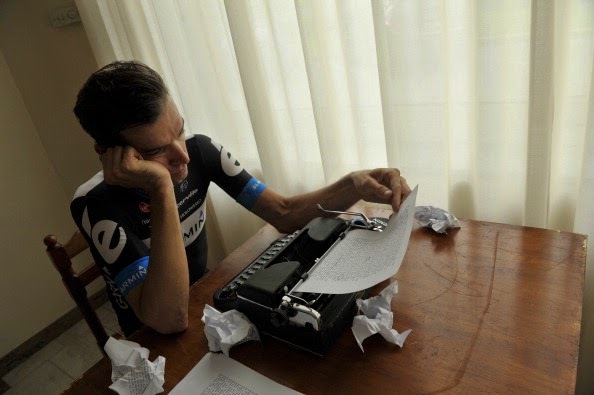 The story was headed "Old geezer writes Tour de France stories on typewriter", as if that wasn't still the right and proper thing to do. 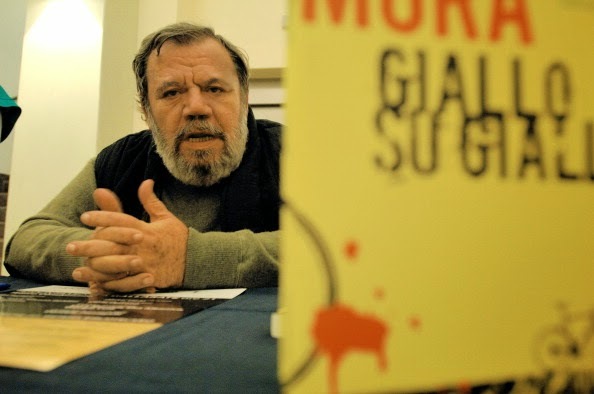 Mura writes for La Republica, a 750,000 daily circulation newspaper in Rome. He was born in Milan on October 9, 1945, and is by now a tour veteran. He first covered the Giro d'Italia in 1965 and the Tour de France two years later. His weekly column on Italian soccer's Serie A had the wonderful title, "Seven days of bad thoughts". 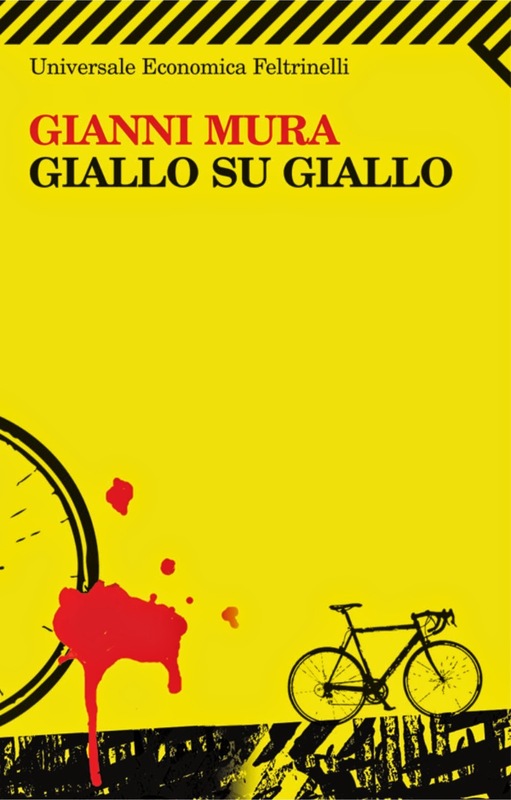 Mura's novel based on the Tour de France, Yellow on Yellow, won the Premio Grinzane-Cesare Pavese for fiction in 2007. Mura said he doesn't like computers - "their silence bothers me" - but he has been known to use such things. Where one story on Mura and his typewriter (not Pretot's article, I hasten to add) got a bit carried away was to suggest, "When Mura first started reporting and using a typewriter, he was technologically advanced. 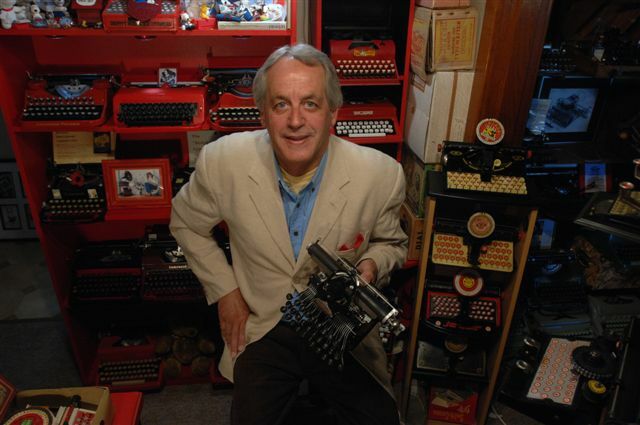 Most reporters 40 years ago wrote their articles by hand." That's complete nonsense. There were as few reporters writing by hand in 1974 as there are reporters using typewriters today. Where Mura was spot-on was to say that the sound of the typewriter is good for concentration. 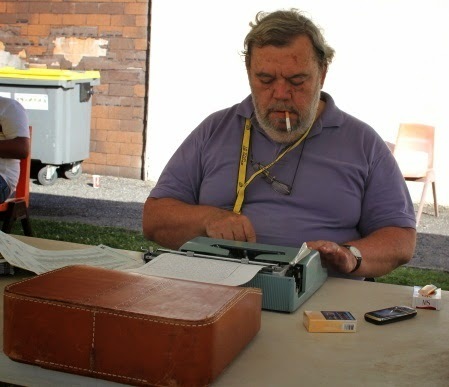 He also likes to smoke while he types - no longer allowed in Tour De France press rooms. 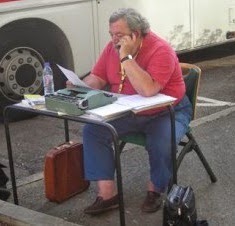 So on fine days he sits outside typing at his own little table (in this case, beside a police van!). 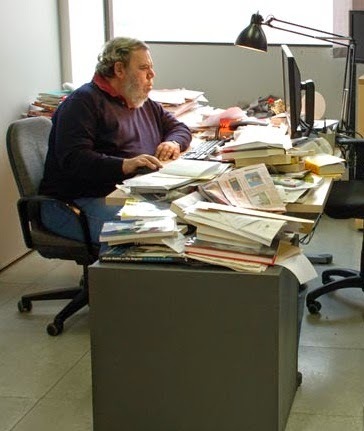 He uses a mobile phone to dictate copy back to his newspaper. 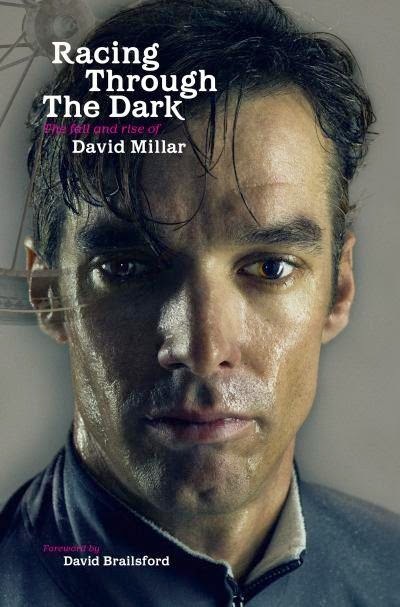 Mura's 2007 tour book was followed four years later by the autobiography of Scottish Tour de France cyclist David Millar, Racing Through the Dark: The Fall and Rise of David Millar. Millar's work was described by Richard Williams in The Guardian as "one of the great first-person accounts of sporting experience". 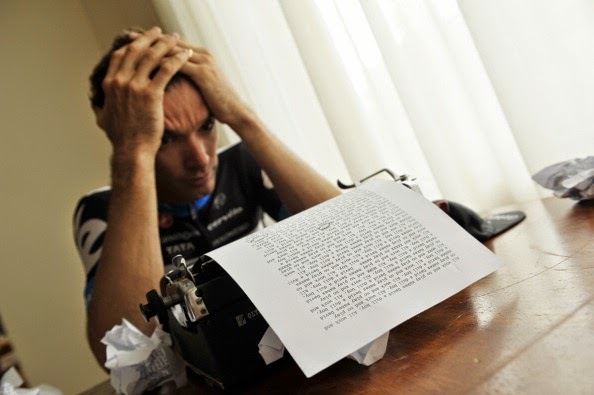 It was called "a rarity", "a brutally honest insight into the life of a young pro with the world at his feet, charting the Scot’s demise into doping and his subsequent revival as one of the most respected riders in the peloton". The book was shortlisted for the prestigious William Hill Sports Book of the Year award. Indeed, hats off to Mura, and double hats off to Millar, a young man deliberately adopting an "old" technology. 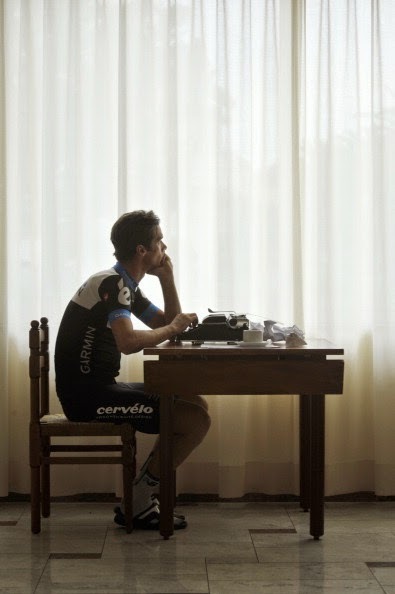 Which proves my point that there is a deep affinity between riding a bicycle and typing on a mechanical machine. Very interesting, and kudos for getting these stories to us! 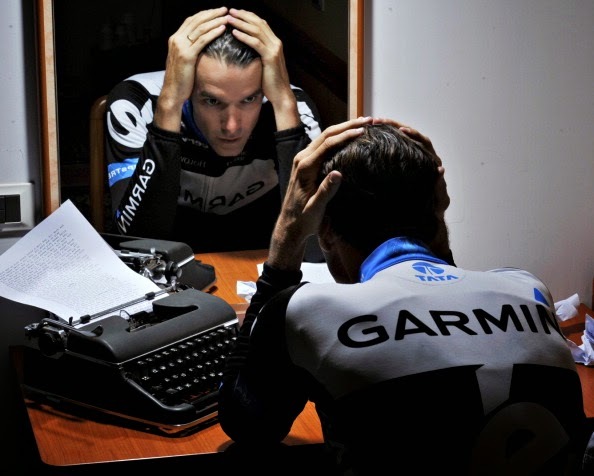 When I write on any one of my machines, I find the physical labor to be a form of exercising, especially if there are any internal demons I'm working out. I wonder if Millar would identify with that?